Up early for a 5:30am arrival at Wellington Airport. Today I flew to Auckland then onto Osaka where I was met by Motoko-san in Kansai International Airport at 5pm. I was taken straight to my hotel, the Hotel Agora Regency in Sakai. This morning I met with two American runners from Barkley, Rachel and Stephen. They had already been up and walked miles through Sakai whereas I had stayed in bed after a long flight! After a brief introduction to each other we were taken for lunch with Tatsu-san, Motoko-san and Yukiko. After this we paid a visit to Nanshuji Temple where Sen no Rikyu is honoured. I learned that Rikyu influenced Chanoyu (Japanese way of the tea) and he was the first tea master. After a walk around the temples in the cool sunshine we then proceeded to drive the Marathon course starting from Hamadera Park. That evening we attended the race reception ceremony. This was my formal introduction on the big stage and I felt proud to be standing with all the other invited runners representing their respective countries. Including myself there was 21 invited runners and I was the only representative from New Zealand. The race and event all of a sudden started to feel real and I was excited for the following day. Here I met with the Mayor of Sakai for the first time and various other supporters of Wellington-Sakai and the Barkley-Sakai associations. I chatted with some other invited runners and made sure I ate plenty of the free food on offer!! Quite a late start for what im used to with Marathons, I definitely appreciated the extra time in bed this morning. The day was clear and still with bright sunshine, a whole world away from the windy storms I had experienced while training for this race in Wellington. I was happy the weather was on our side even if it was a lowly 9 degrees on the start line. I wore my normal running gear, the Wellington Harrier Singlet and teamed it with thermal sleeves and gloves. After a few messages home and leaving the warmth of the VIP areas myself, Rachel and Stephen had time for a brief warm up and we met again with some supporters from the Berkley-Sakai Association who had made the most brilliant posters with our names on it! All the hustle quickly came to a halt when the line up was called and within minutes we were on the start line, wishing each other luck and then we were off! The first 5k I took easy and enjoyed the atmosphere of the crowd at the start. I started to heat up quickly and within a few KMs I no longer needed my gloves. I was lucky enough to spot the Berkley-Sakai supporters on the road side and to their surprise I threw my gloves over to them for safe keeping! After the first 5k I was strictly sticking to my plan to run between 4:20/4:30 per KM. I had in mind to run this race with average KMs of 4:33 minutes and knew I would need to take the flat part of the course a little faster to make up for lost time on the bridges and inclines towards the end. Throughout the whole run I felt strong, I thoroughly enjoyed this course as it was very fast, flat and straight. The support of the crowd was brilliant and I enjoyed the various bands and drums along the route. The first major corners were nearing the 30k mark and the hills of the bridges were around the 32k mark this is the first place I started to slow. After a struggle up the 4th incline on the bridges I came into the finish line, feeling a bit wobbly, sun burnt and exhausted but in all I felt fantastic! All the build up and training and now the race was over. To me it hadn’t felt like I had been running for 3 hours 11 minutes and 35 seconds it felt a lot shorter! In my gender I was 11th place. In my category I was 5th place. Happy that I had done the Wellington Sakai Association proud, I collected my certificate and plaque for 5th place. We then waited for Rachel and Stephen to come through who both finished the race under the cut off time of 5 hours. We were then taken back to the hotel to recover and went out for dinner, with plenty of food and drink on offer I felt almost back to normal. Motoko-san picked us up and we had lunch in Sakai. We visited Sakai Plaza Museum and experienced a traditional tea ceremony. We were then taken to the city council building where we were formally introduced to the Mayor and the Chair of the City Council, we exchanged gifts and talked about our experiences in the Marathon. The welcome party with the Marathon and Athletic comittees was later that evening. We met our host families here, Shiro Nagashige was my host and I learnt his motto in life is to be active, “youth is not a time of life it is a state of mind.” With this evening came a lot of speeches, gift giving and amazing food! 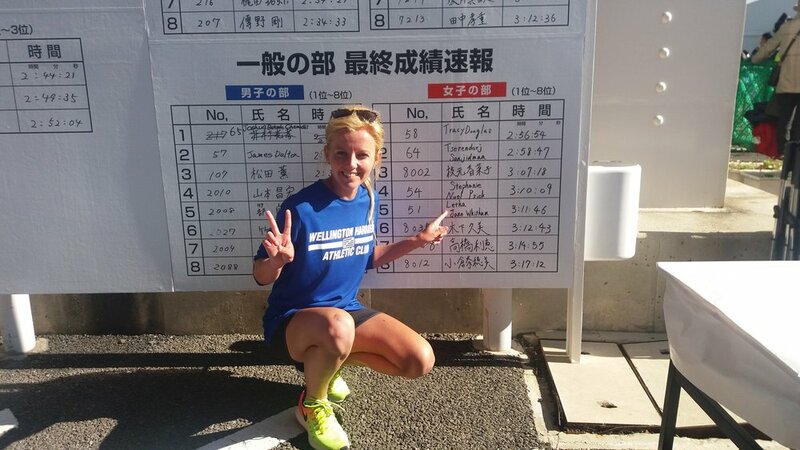 I met with Yumiko Tanaka again who had been the Sakai female runner in Wellington Marathon the year before. After a late night we went our separate ways to our host families homes. A dusting of snow this morning, today my host family were showing me the sights of Sakai and Osaka. We took a bus to the subway and walked through the shops and restaurants of Dotombori, it was very busy and everyone was eating the seafood on offer, here I tried Okonomiyaki for the first time. I had never tasted anything like this cabbage pancake, it was amazing! Of course I couldn’t leave without having my picture taken in front of Glicos running man. A short subway ride later we had arrived at Sakai Castle, very impressive from the outside and great views from the top however the walk back down 6 floors and flights of stairs proved tough on my sore legs! From here we took a taxi to Osaka central business area and walked through the old and new buildings here. That evening back at home with Shiro-san I was treated to traditional homemade sushi and he showed me more of his home where he lives with his wife and we talked more about his life with his family and life in Japan compared to New Zealand. My last full day in Sakai with the host family. I was very excited to visit the children at school. I was reunited with Rachel and Stephen for the visit and we enjoyed talking about New Zealand and America with the children. The kids sang us songs and asked us questions and in return we handed out gifts for the children. Afterwards we then made our way back into Sakai for another day of sightseeing. My host Shiro-san took me back to the City Council building in the morning where me, Rachel and Stephen were then taken to Osaka train station. A few photographs and goodbyes later we were on our way. Tatsu-san accompanied us to the train station and ensured we bought the right tickets to the right destination. I was headed to Tokyo for 3 days on the Shinkansen, Stephen and Rachel were heading to Kyoto. I absolutely loved the Shinkansen, it felt more like being on plane than a train. Just under 3 hours later I arrived in Tokyo and took my first of many journeys on the subway to my ‘cabin’ hotel. I woke early for a full day of visiting Roppongi Hills Tower viewing deck, Asakusa Nakamise Street market, Sensoji Temple, Tokyo Skytree, Shibuya Crossing, Rainbow Bridge and yes I went shopping! I cant remember how many times I got lost on the subway this day. I got every kind of lost in the underground, you name it I did it. I took the wrong line, went the wrong way, bought the wrong ticket and got off at the wrong station in a completely different area. A steep learning curve in the ways of the Tokyo Subway network. Today I ventured out of Tokyo to get a view of Mt Fuji. While I was leaving Tokyo from Shinjuku Station the sky was clear with bright sunshine, I thought this was a perfect day to see the mountain. Roughly 4 hours of travel later on the Hakone one pass I reached my viewing point and unfortunately wasn’t greeted with a view of the mountain, instead there was just cloud! But I made it and I was there, in the view of Mt Fuji so I was happy. All in all an 8 hour round trip from my starting point in Tokyo. Chiyoda, Tokyo Marathon then home. 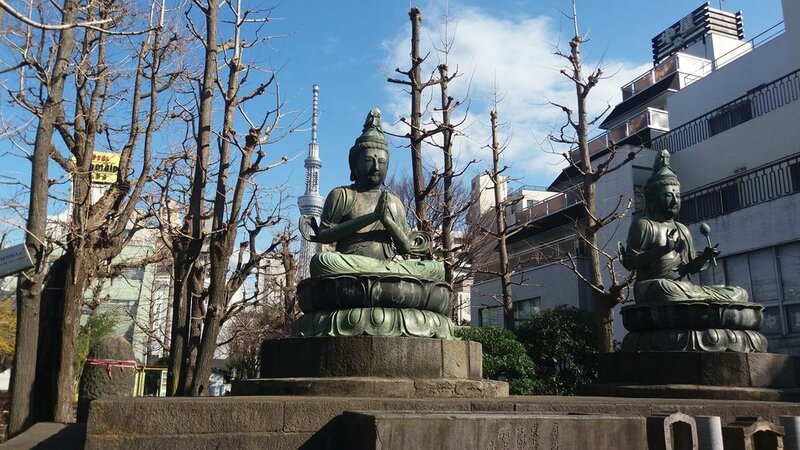 This morning I woke early to have a quick run around the area known as Chiyoda. It was pure coincidence that Tokyo Marathon was also running this day so I made my way to the near the finish line to support the runners there. A quick trip back to my hotel to pick up my bag then I was off to the airport to catch my flight back home to Auckland and then Wellington.